Reykjavik is the gateway to a jagged land of fire and ice. With its widespread lava fields, massive glaciers, deep fjords, lush lowlands and high plains, Iceland is a haven for geology and nature lovers. The city is the region's cultural and financial center. The most popular tours visit the Golden Waterfall, the Strokkur Geyser, Thingvellir National Park, the Blue Lagoon and The Pearl, a domed building offering exceptional views of the city. 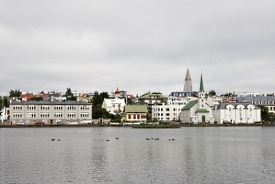 Skarfabakki Harbour is located approximately 45 minutes from Keflavík International Airport. After exiting the airport, head north on Route 41, and follow Route 41 for 49km. Turn right toward Vatnagardar, then left onto Vatnagardar. Turn right onto Sundagardar, and at the roundabout, take the 2nd exit onto Klettagardar. Turn right onto Skarfagardar, and you will reach the harbor.